Joe Flacco threw for a 363 yards and a pair of scores. Justin Tucker kicked four second-half field goals. Baltimore's defense did the rest. See photos. The proof came in a cruelly efficient 26-14 victory over their AFC North rivals on Sunday night that looked an awful lot like how it used to look when Baltimore had it going earlier in head coach John Harbaugh’s tenure. Joe Flacco threw for a 363 yards and a pair of scores. Justin Tucker kicked four second-half field goals. Baltimore’s defense did the rest, keeping Ben Roethlisberger and Antonio Brown under wraps over the final 30 minutes as the Ravens (3-1) ended a three-game losing streak to the Steelers (1-2-1). Pittsburgh managed just 47 yards in the second half, sputtering in a place the Steelers have so often soared. Not this time. Not on a night they converted just 2 of 12 third downs and didn’t take a snap in Baltimore territory after halftime. Two years ago, the Ravens fell on Brown’s “Immaculate Extension” on Christmas night. Last winter, Baltimore scored 38 at Heinz Field … and got beat on a field goal in the final minute. Those memories have been hard to shake. Maybe that’s what made this one a little sweeter than most. Even Harbaugh admitted this wasn’t just another opponent and this wasn’t just another victory, answering loudly “yes it does” when asked if there was a different vibe this time around. The Steelers (1-2-1) came in having won nine straight Sunday night appearances. Baltimore brought Pittsburgh’s run to an abrupt end. Roethlisberger finished 27 of 47 for 274 yards with a touchdown and an interception for the Steelers. Brown caught five passes for 62 yards, including his second touchdown pass in as many weeks. Yet Pittsburgh couldn’t generate anything in the second half. The Steelers mustered three first downs after the break and there was no balance to be found. Pittsburgh ran the ball 11 times for 19 yards, the absence of All-Pro running back Le’Veon Bell — who has yet to sign his franchise tender — growing more acute by the week. Harbaugh called Flacco’s play “phenomenal.” Flacco isn’t quite ready to go that far. If anything, he was angry the two teams were tied at the half after Baltimore let an early 14-point lead get away. Flacco wasted little time helping Baltimore race to a 14-0 advantage. He found John Brown open on a 33-yard touchdown pass on Baltimore’s opening possession. Brown was double covered when Flacco let the ball go. By the time Brown chased it down in the end zone, both Steelers were two steps behind him and the Ravens were in front. Baltimore’s 14th red-zone trip ended up far differently and briefly swung momentum. 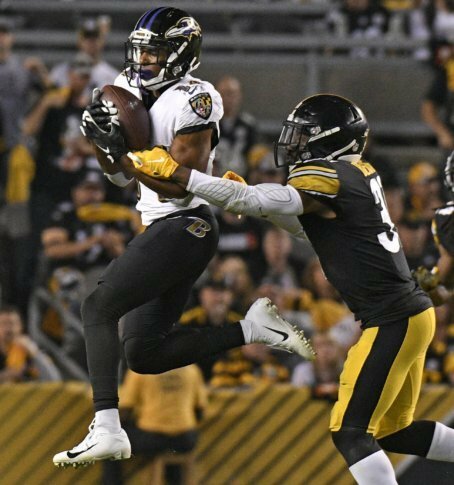 The Ravens had the ball at the Pittsburgh 2 with a chance to move ahead three scores when Steelers free safety Sean Davis ripped the ball from Collins and Pittsburgh rookie strong safety Terrell Edmunds recovered. This story has been corrected to update Baltimore’s next opponent as Cleveland, not Tennessee.